The SCC3 is a solar charge controller, it's function is to regulate the power flowing from a photovoltaic panel into a rechargeable battery. It features easy setup with one potentiometer for the float voltage adjustment, an equalize function for periodic overcharging, and automatic temperature compensation for better battery charging over a wide range of temperatures. The design goals of this circuit were efficiency, simplicity, reliability, and the use of field replaceable parts. A medium power solar system can be built with the SCC3, a 12V solar panel that is rated from 100 milliamps to 20 amps, and a lead acid or other rechargeable battery that is rated from 500 milliamp hours to 400 amp hours of capacity. It is advisable to match the solar panel's maximum current to the battery's amp-hour rating (C), a typical battery charging current is C/20, so a 100 amp hour battery should have a solar panel rating of around 5 amps. Consult the battery manufacturer's data sheets for the best rating. See the full SCC3 kit specifications for a more detailed list. The power control circuitry of the SCC3 routes the operating current from the solar panel input through Q3 and IC3. When the solar panel voltage exceeds 12V, zener diode ZD1 conducts and turns on Q3, providing power to IC3. IC3 produces a regulated 5 Volt power source. The 5V is used to power the circuit's logic and as a reference voltage for comparing to the battery float voltage. The float voltage comparator IC1a compares the battery voltage (divided by R1/VR1 and R3) to a reference voltage (divided by R5 and R6). The comparison point is offset by the thermistor TM1 for temperature compensation. The comparison point is also modified by the Equalize switch, S1 and R2. The output of IC1a goes high (+5V) when the battery voltage is below the float voltage setting. The output goes low when the battery voltage is above the float voltage setting. 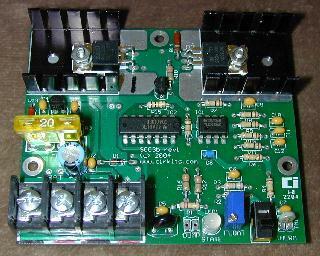 This provides the charge/idle signal that controls the rest of the circuit. The charge/idle signal is sent to IC2a and b, a pair of D-type flip-flops. The flip-flops are clocked by the IC1b phase-shift clock oscillator. The clocking causes the flip-flop output to produce a square wave charge/idle signal that is synchronized with the frequency of the clock oscillator. The two halves of IC2 operate in synchronization, IC2a is used to drive the current switching circuitry, IC2b is used to drive the charging state indicator LED either red (charging) or green (floating). The clocked charge/idle signal switches bipolar transistor Q1 on and off. The Q1 signal is used to switch power MOSFET Q2, which switches the solar current on and off through the battery. 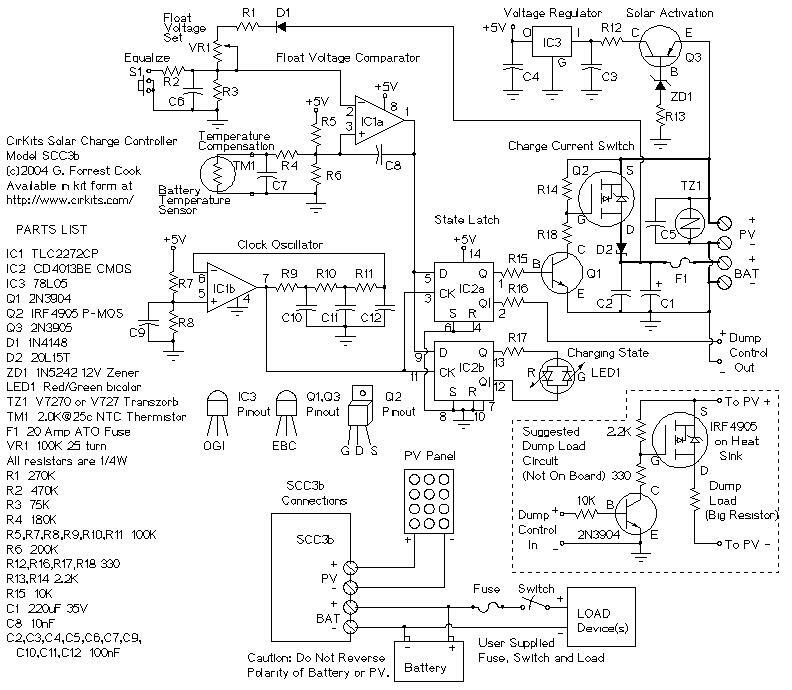 The solar charging current flows through the heavy lines on the schematic. Diode D2 prevents the battery from discharging through the solar panel at night. Fuse F1 prevents excessive battery current from flowing in the event of a short circuit. Transzorb TZ1 absorbs transient voltage spikes that may be caused by lightning. The dump load control circuit is optional. When the battery reaches the float voltage, the main circuit turns off the solar power. This otherwise wasted power can be steered to a power resistor or other load device through the second IRF-4905 MOSFET transistor. Typical uses of the dump current would be to warm the battery bank in a cold climate, or to heat a small water tank. In installations where the main battery reaches a full charge early in the day, the dump current can be used to provide power to a secondary SCC3 charge controller/battery pair. Put the solar panel in the sun, and watch the battery charge up. Systems where the battery is frequently discharged way down should occasionally be run in equalize mode from several hours to a full day. When the battery is low and the sun is shining, the LED will be red. As the battery reaches the float voltage, the LED will alternate red/green. When the sun goes down, the LED will shut off. Plug: Buying the kit saves you a lot of trouble locating parts and wiring the circuit. ZLPOWER is professional manufacturer of MPPT solar charge controller 12V/24V 40A, PWM technology, with battery type selector, can be easily parallel to be 80A, 160A, and so on.